Obama stands over the corpse of Santa and his reindeer, somewhere in Northern Maine. 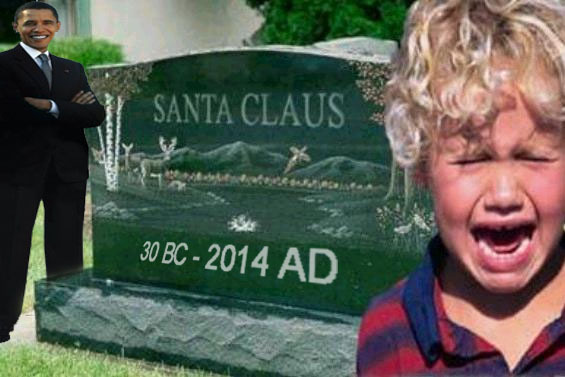 Parents, please tell your children that Santa will not be delivering any Christmas presents this year. Barack Obama has used NORAD to track down Santa and hunt him down with surface-to-air missiles. Obama is trying to marginalize Christmas and what better way to destroy Christmas than destroying Jesus and Santa. Mark my words, Obama is not going to rest until he has his hands around the neck of Christ and is lording over a dark army that vomits at the mention of angels, Christmas, America, freedom, capitalism, oil, nuclear family, values, morality and conservatism. It is sad that Obama is being allowed to act like his buddies Robert Mugabe and Idi Amin. Santa Clause was one of the oldest living Christians on Earth. Atheists have tried to say he does not exist for years, but that is all a lie. Obama has now made it possible to say Santa does not exist. Obama is inviting children to DC today to visit ‘Santa’. But when the kids arrive to the White House, they only find that Obama has buried Santa in a massive grave on the White House lawn. Little Billy Oliver cries out in agony as Obama smiles, watching the child’s anguish melt away his innocence and prepare his mind for a dark, liberal Jesusless future where Santa is dead, gays get to be merry, ISIS has its own country and America is a dark socialist empire.